You run a great tour - I'll be singing your praises to everyone when I get home. Cindy & I have used many cycling companies since we starting bicycle touring back in 1993: Back Roads, Bicycling Adventures, Timberline, Bike Alaska and Western Spirits to name a few. Since 2007 we've been fortunate enough to take another four tours with Cycling Escapes. We believe Cycling Escapes stands head and shoulders above the competition. We had a great time in Solvang. It was just what we needed – challenging biking during the day; great company and food at night. I can see myself repeating this trip. I just wanted to say Hello and Thank you to you all for a wonderful week of cycling and support!!! I think we had a great group, excellent weather and a terrific trip!! The tour definitely made us stronger and we have results (in watts) to prove it. Again, thank you for an awesome "intense" cycling week! I have already spread the word of your tour while waiting at the airport. Rich, Erica and Adam; Barb and I could not have had a better time! What an awesome team the 3 of you make! Thank you for all you do to support the riders, feed us and put us up in great hotels. We look forward to our next adventure with you. Thanks for an outstanding tour! Beautiful routes, outstanding support, unbelievable food, wonderful accomodations. I'll sign up for another tour for sure! What distinguishes Cycling Escapes from other tours for me is: great routes on quiet roads with no traffic and plenty of climbing, a tour leader with 11 years experience that makes all the difference. Appreciate all your attention to detail and your magical connection with the weather oracle. It was a challenging and enjoyable trip thanks to your doing! Thank you so much for making this a great cycling trip. The tour was so organized, well supported, and with attention to detail, we felt well taken care of. I especially appreciated the chocolates! Just a quick note to say how fortunate I feel to have had this experience with you, Erica and Adam. The trip was even better than I had imagined it would be. Thank you so very much! With over 300 days of sunny weather, the southern California Wine Country made famous in the movie "Sideways" is an ideal place to put some miles on those winter legs. Our base camp on this cycling vacation is Solvang, a small Danish Village in the heart of the Santa Ynez Wine Region. You'll enjoy exploring the shops and delight in sampling the local wineries after each day's ride. Solvang, California is our destination on this challenging wine country tour. Fly into Santa Barbara, California on Sunday where a shuttle will pick you up and make the quick thirty minute drive to Solvang. Our home base for the week is the lovely Wine Valley Inn. After a short orientation we will set up bikes before going for a 30 mile ride around the Santa Ynez Valley. Afterward, explore the Danish town and maybe go wine tasting before dinner. 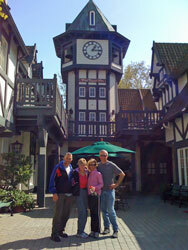 "Solvang is in the middle of California about 15 miles from the coast. It is like being in the middle of a Steinbeck novel. Huge valleys with lush pastures and private vineyards. Rolling hills with long narrow two lane roads. There is very little traffic and the people are generally friendly and accommodating. The best part is that during the day the temperatures reach the low to mid 70’s. In other words perfect riding conditions." Get ready for amazing views on the third day's bike ride! We'll cycle all the classic Solvang rides this week, including Figueroa Mountain, which rises nearly 4,500' feet above the Santa Ynez Valley. This is a climb you will not forget, and you'll earn the dramatic views before the giant descent into the charming town of Los Olivos. After the ride, join us for wine tasting at our favorite winery. The fourth day finds us cycling past vineyards and through deserted canyons as we make our way toward the ocean and the panoramic views of Jalama Beach. A favorite with local riders, the approach to the beach is covered with wildflowers in the spring. After the ride, explore the town at your leisure, or join us as we visit a winery and sample their award winning selections. Today we cycle along the pastoral roads of Foxen Canyon as we wind up, down and around through the heart of wine country. Veering off from the wineries, we'll climb a deserted canyon road as we crest the mountains to the north of the valley, before descending back to Foxen Canyon and a surreal ride into Solvang. Afterward explore the shops of Solvang, sample the local fare, or go wine tasting at one of the many local wineries. Our final day we link up sections of popular local bike rides, including the Solvang Century, Harris Grade, Drum Canyon and the Old Wells Fargo Stage town of Los Alamos. We'll finish our ride with time to take a shower and check out of our hotel before shuttling to Santa Barbara. After Friday's ride we shuttle to Santa Barbara, California with time to catch a flight after 3pm..